I bought the Marmot Kompressor Plus on a whim. I parked behind Mast General in downtown Asheville one day and decided to cut through the store. They were offering up to 25% off on 4 items, so I grabbed a few single-serving Good To-Go meals and sorted through the daypacks. I don’t need much out of a day pack. I really only want something to hold my water bottles, store some first-aid/comfort items, and stow away my jacket when I inevitably shed layers. 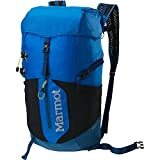 I settled on the gray Marmot Kompressor Plus 20L Daypack and I haven’t had a single regret. It’s probably more pack than I typically need, but I like the extra space in case I need to stow a fellow hiker’s jacket and personal items. This is an ultralight pack with a minimalist set-up that fits my hiking style very well. It is not the kind of pack you would want to carry all of your schoolbooks in. I’m not sure I’d rely on it to carry much more than a jacket and a laptop around town. To cut down on weight, there is no padding in the shoulder straps. The only padding in the back is a thin piece of foam that serves to separate the optional water reservoir area from the rest of the main compartment. So you will feel the angles of bulky items. I keep a slim first-aid kit and some basic necessities in the event that my day-hike turned into an unfortunate overnight hike (headlamp, space blanket, lighter, compass, thermometer, water purification tablets, protein bars). I also keep the daily necessities like bug spray, sunblock, anti-chafe, and lip balm. That might sound like a lot of stuff, but it all weighs a combined 4 oz. This pack basically serves to hold my layers as I shed them. In the cooler months, I frequently start off hiking with a wool beanie, a puffy jacket, and a wind jacket. As I warm up, I mix/match/remove these layers. I also bring lunch on longer treks. I never feel this weight on my back thanks to this pack. I honestly forget that I’m wearing a pack much of the time. I’m only reminded when I contort myself into strange positions to crawl under, or scramble over, an obstruction, and one or both of the water bottles fall out. I blame myself for that. The pack is easy to adjust for comfort and includes optional waist straps to hold the pack tight against your back for trail running. I hate running, so I just keep those straps bundled under the pack. The chest strap is adjustable vertically as well, allowing you to find the perfect fit. I wouldn’t carry a reservoir in a thin pack like this. This is a minimalist set-up and it works better with two 16-oz water bottles carried in the side pockets. If you need to carry more water, pack two 1-liter bottles instead. You can’t grab a water bottle or access anything in the pack pockets without hanging it off one shoulder. The pack is made the thin material, but that’s what makes it ultralight. I feel like it could puncture or gash if I’m not careful, but it hasn’t torn yet. It’s not waterproof. I keep a trash bag inside it all the time, but it would be more convenient if it was at least water resistant.